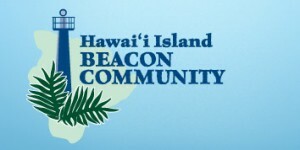 The Hawaii Island Beacon Community (HIBC) has selected 17 community-based projects for its Healthy Eating and Active Living (HEAL) Program aiming to effect positive changes in people’s eating, physical activity and tobacco use habits. Supported by approximately $300,000 of HIBC’s federal funding, the HEAL Projects will run through February 2013 and directly reach over 15,000 Hawaii Island residents in all regions, of all ages, from diverse ethnic groups—including those most at risk. The HEAL Program kicks off with a mandatory health literacy training day on March 15, 2012 for the leaders from all HEAL Projects. Throughout the year, updates and testimonials will be posted at hibeacon.org. Hawaii Island Beacon Community (HIBC) is an island-wide federally funded collaborative project administered through the College of Pharmacy at the University of Hawai‘i at Hilo, working to improve health care on Hawai‘i Island. Through technology, clinical transformation, and outreach, HIBC is committed to improving the health of Hawai‘i Island residents and empowering them to be more actively involved in their own health. For more information, visit www.hibeacon.org.